This recipe for BBQ Seitan Quesadillas is really good. I had left over BBQ sauce from July 4th that I wanted to use up. You can either make your own sauce or purchase your favorite brand. I used original seitan from Sweet Earth, but tempeh would also taste really good, or you could easily make your own seitan. Heat a grill pan or skillet on medium-high and cook pineapple slices on both sides until lightly charred and caramelized. Set aside to cool and then dice and place in a bowl. Add all other ingredients and stir to combine and and chill until ready to use. Mash avocado with a fork until smooth and add other ingredients and stir to combine. Slice seitan into strips and lightly fry in a saute pan. Add BBQ sauce to taste, heat through and set aside. In another saute pan, add a little canola oil and saute red onion until caramelized, season with salt and pepper and set aside. Thinly slice red cabbage, add lime juice and salt and pepper to taste. To assemble, heat a large saute pan on medium heat and brush lightly with canola oil. Lightly coat one flour tortilla with BBQ sauce, sprinkle with cheddar and mozzarella cheese, add strips of BBQ seitan, caramelized onions and top with more cheese. Press another flour tortilla on top and transfer to saute pan and fry on both sides until golden brown. Transfer quesadilla to a cutting board and cut into slices. 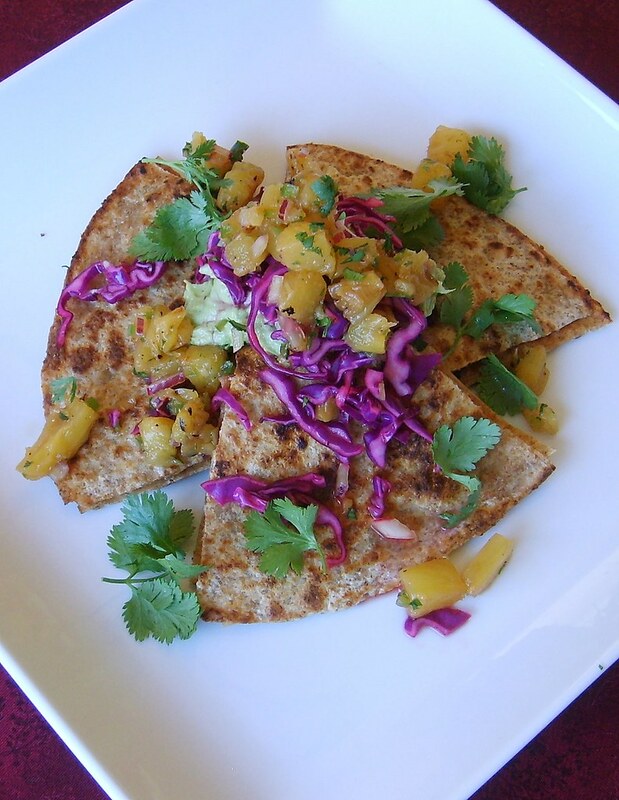 Garnish with guacamole, red cabbage, pineapple salsa and cilantro leaves.